We love it when local schools, clubs, and churches support Khushi Feet. There are many ways groups can get involved. Fundraising in groups is not difficult and can be great fun! Cake Sales, Coffee Mornings, Sponsored Events, Fancy Dress Days, Jumble Sales…use your imagination and raise loads of cash for Khushi. If you are planning some fundraising, please contact us for information on how to get the money to us. Would your group like to learn more about Khushi Feet? Would you like Khushi the Cow to come to your fundraising event? Get in contact and we can arrange a visit. In the lead up to Khushi Feet’s World Record Attempt, we will be running Bollywood Dance Workshops at local schools and clubs. The workshops are for all ages and abilities, they are very exciting, and will give you an opportunity to learn to the (hopefully) record-breaking routine in advance of the event on Saturday 29th June 2013. There is no cost involved but we do encourage participant to make a donation to Khushi! 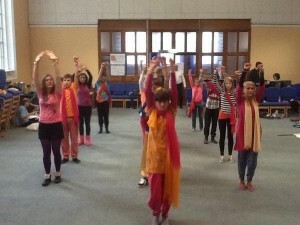 If you are part of a group or club and are interested in having a Bollywood Workshop, please contact us.